The Pug Dogs, one of the oldest breeds, has flourished true to his breed down through the ages from before 400 B.C. He has always been domesticated and has endeared himself to mankind. In 1860, British soldiers sacked the Imperial Palace in Peking, and dogs of the Pug and Pekingese type were brought back to England. This was the first time since the early 16th century that dogs in any great number had been brought out of China. Black Pugs were imported from China and exhibited for the first time in England in 1886.The Pug was accepted for registration with the American Kennel Club in 1885. There is much debate over the true origins of the Pug, but it is generally believed that the breed came from China. 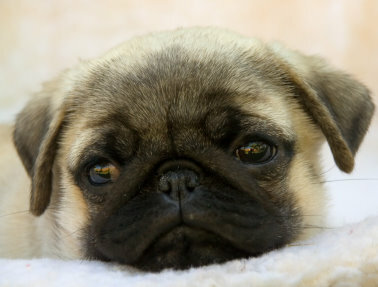 The Pug may be related to the Pekingese, though some believe the breed came from the Bulldog or Mastiff. The Pug was once the companion of Buddhist monks in Tibet. 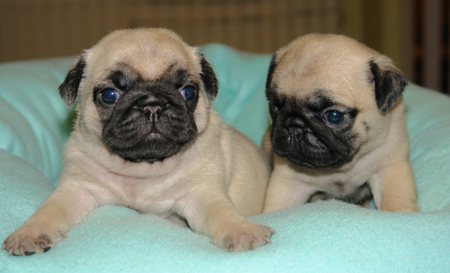 Pugs belong to a select group of 8 breeds tracing back to Ancient China. They date as far back as the Han and Tang Dynesty, around 150 BC and were refined for centuries for the sole purpose of entertaining the inhabitants of the Imperial City. Long before the Communist Party condemned pet dogs in China as a bourgeois luxury, pugs had safely made their way to the Royal Courts of Europe - still playing the role of the court jester. They were not only comic in appearance, they had the perfect temperament - faithful, eager, clever, affectionate, good-natured, hedonistic and irrepressibly high spirited. They loved and entertained such notables as the Marquise de Pompadour, Marie-Antoinette, King George III and Queen Charlotte, Empress Josephine, Queen Victoria, the Duke and Duchess of Windsor, and Prince Rainer and Princess Grace of Monaco. 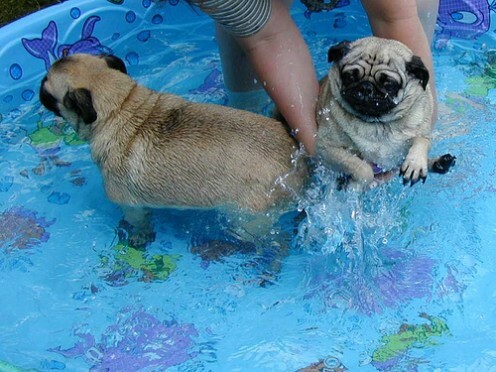 The time and route taken by pugs from China to Europe is not precisely known. The best researched and documented book I have found on the subject is For The Love of Pugs by Robert Hutchinson (Browntrout Publishers, Inc. 1998). It is frequently said that the first documented reference to pugs in Europe dates to 1572 when a small dog heroically awakened his master - William of Orange and leader of the Dutch revolt - just in time to save him from Spanish raiders in what is now southern Belgium. Alas, Hutchinson feels this was a case of mistaken identity. The earliest unambiguous record of a pug in Europe is the appearance of a perfect little fawn pug in a French painting entitled "Louis XIV and His Heirs", painted around 1713 or 14. The next was a pug as the subject of a painting entitled " Un Carlin" commissioned by Louis XV in 1730. Outside of France, pugs first appearance occurred when the English pictorial satirist William Hogarth started using pugs as quasi-human actors in social situations. Hogarth owned a series of pugs with "Trump" being his most famous and most beloved. In 1740 Louis-Francios Roubiliac - the most important sculptor working in 18th century England - modeled complementary terracotta sculptures of Hogarth and Trump, later produced in porcelain by the Chelsea pottery factory. Around the same time the prolific German sculptor, Johann Joachim Kaendler, Modelmeister of the famous Meissen porcelain factory in Germany, was commissioned to create an entire series of exquisite porcelain pug figurines to serve as secret emblems for the German underground Freemason lodge know as the "Lodge of the Order of the Pug" (Hogarth was a very prominent Freemason.). Meissen continues to produce some of the most handsome porcelain pug figurines - still with the long legs, relatively long muzzle and cropped ears typical of 18th and early 19th century pugs ( see my personal collection). 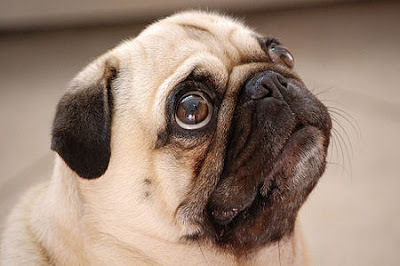 Pugs remained popular through the 18th century, but slipped in popularity in the early 19th century. After 1860 a new wave of pugs were imported from China with shorter legs and the now-familiar "pug nose". Popularity was regained when pugs became a favorite of Queen Victoria - who banned the cropping of pugs ears, feeling it was unnecessarily cruel. The companies that made the famous Vienna Bronzes began including pug dogs in their animal repertoire during Queen Victoria's reign. In the early part of the 20th century, pugs - along with cats and frogs - became the most popular Vienna Bronze animals created in human attitudes and activities ( see my personal collection) - continuing the satirical use of pugs as humans started by Hogarth and carried on by "Toby" in that quintessentially English satirical magazine, Punch. Vienna Bronze figurines continue to be made today from those same molds. They have retained their popularity and value to such a degree that an American branch of Bermann Company guarantees to take the bronze figures back at any time for the purchase price. The Duke and Duchess of Windsor were probably the most famous pug fanciers in the 20th century. They took their pugs, (along with their pugs' personal chefs and "pooper scoopers") with them to almost all social activities. Pugs became popular in the United Stated in the 20th century both a pets and show dogs. Famous U. S. pug parents included Harriet Beecher Stowe, Sylvia Sydney, Lena Horne, Sammy Davis, Jr. and Andy Warhol, as well as Grace Kelly. Recent silver screen appearances include one of the title roles in Otis and Milo (1989) and the alien, Frank, along with Tommy Lee Jones, in Men in Black (1997). A "must read" for pug parents is the book, Clara (Random House, Inc., 1998), by Margo Kaufman, the recently deceased and much missed Hollywood reporter for the national pug magazine, Pug Talk. It is a tribute to the democratic nature of pugs that in the latter part of the 20th century and entering this 21st century, pugs have made happy homes not only with the rich and famous, but entwined themselves in the heartstrings of the common man and woman, making us feel like kings and queens.